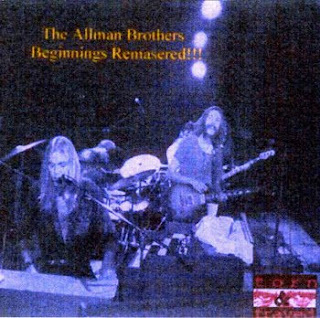 The Allman Brothers "Beginnings" is one of the first two-fers, being the first two albums "The Allman Brothers" (1969) and "Idlewild South" (1970). This is a Mickboy Remaster that I got from the great Pink Robert torrent site a couple years ago, sadly the site is now defunct. Mickboy does "needle-drops" like Dr. Ebbetts of Beatles fame. Mickboy is mostly known for his reworking of the Rolling Stones catalog, but he obviously has done other artists - his version of Led Zeppelin IV is awesome. I don't think anybody knows for sure what guys like Mickboy actually do, besides getting hold of the highest quality vinyl available and then taking it into a studio. Whether or not his "remasters" sound better or just different, that is something only you can answer. To my ears this sounds pretty good. The Mickboy covers are pretty ragged, the regular covers are in the file. ooh, the allmans, with duane, this is delish, anth. Thanks, my friend. I haven't checked it against the original cd or vinyl, but it sounds mighty fine. Best to you always, Eddie. Hello fellow long-time blogger Eddie! Hi mikejoint! Thanks for the tip, I ordered it just now. Thanks again! !